Start the RunCzech season with one of the biggest running events in the Central Europe! Every year the Sportisimo Prague Half Marathon excites spectators with performances of elite athletes breaking records. Enjoy a course with incomparable scenery in the heart of historic Prague that follows along the Vltava river and crisscrosses five beautiful bridges. Take in majestic views of the Charles Bridge, Prague Castle, the Rudolfinum Concert Hall, the National Theater, Vyšehrad Castle, and the Dancing House. 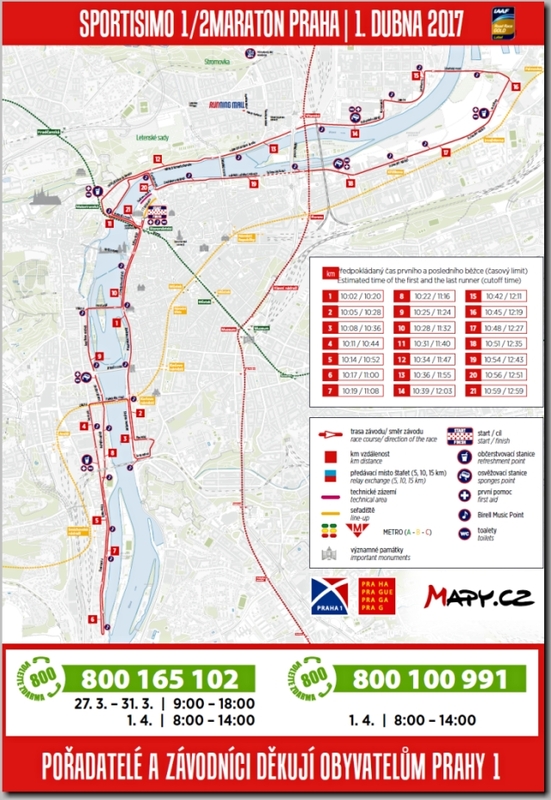 If you are hoping to improve your time, the Sportisimo Prague Half Marathon offers fantastic speed; in 2012 it set the record as the fastest half marathon in the world! Half distance, full satisfaction! 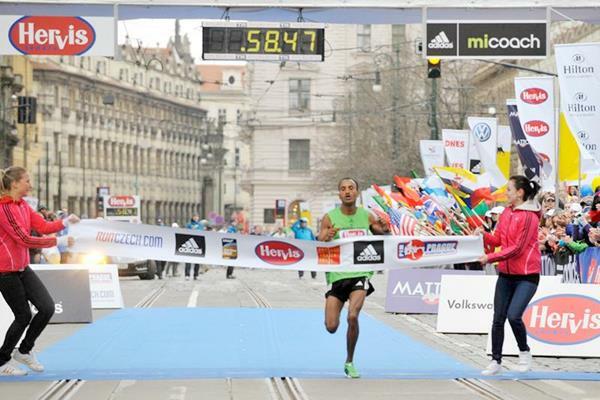 Joan Melly won the Sportisimo Prague Half Marathon April 7, clocking 1:05:04 in the Czech capital to highlight the 20th running of this IAAF Gold Label road race. On a tear from the outset, Melly passed the opening five kilometres in 14:51, reached 10k in 30:14 and 15 in 45:54, an ambitious pace that came back to haunt the 27-year-old Kenyan in the waning stages. Her performance nonetheless elevated her to the No. 4 position all-time with the fifth fastest run. “The first fivekilometers were exceptionally fast with us running it in under 15 minutes, but I didn’t look at my watch at all, I just followed the pacemakers," said Melly, who set her previous lifetime best of 1:05:37 at the RAK Half in Ras Al Khaimah in February, where she finished fourth. "I felt my strength wane a bit towards the end, but it was still enough to break a new personal best and secure a win. I’m incredibly happy I managed to do it in Prague and would like to thank everyone who helped me achieve this result." Her compatriot Caroline Chepkoech Kipkirui was second in 1:06:09 followed by Worknesh Degefa from Ethiopia, the runner-up last year and winner in 2015, who clocked 1:08:10. In the men's race, Benard Kimeli broke from a three-man pack in the finalkilometer to claim an emphatic victory in 59:47. "I won the 10-kilometer Birell Prague Grand Prix last year, and now can add the half marathon to that," said Kimeli, who dipped under the one-hour barrier in just his second race over the distance. He finished eighth in Ras Al Khaimah in February, clocking 1:00:16. He clocked 27:10 in that Prague 10km last year, the fastest performance in the world in 2017. "Prague really suits me and I race well here. The conditions went in ourfavor today and I’m really pleased that I managed to win." Geoffrey Yegon was second in 59:56 with Peter Kwemoi third in 59:58 to round out the Kenyan podium sweep. Spots four through nine also were claimed by Kenyan runners.